As sweet as sweet can be! A beautiful, elegant dress perfect for formal occasions when you need to dress to impress! 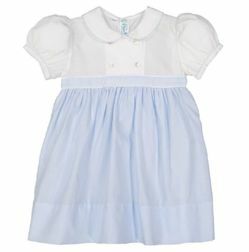 This little girls dress features a white double breasted top with dainty piping along the peter pan collar and puff sleeves. A sweet gather-pleat skirt comes in light blue. Opens with buttons down the back for easy-on easy-off convenience. Matches brother's Jon Jon and perfect also for Easter and Portraits.